An appeal to raise more than £60,000 to reopen a Suffolk church to bell ringers has reached its target. 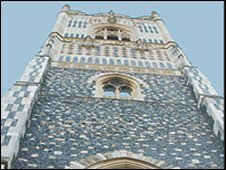 Ipswich Historic Churches Trust (IHCT) has announced that a project to lower the bells in St Lawrence Church in the town will now go ahead. The bells are believed to be the oldest ring of five bells anywhere in the world but they have been out of use after the church tower weakened. Four of the bells date from about 1450 and the fifth was added in 1480. IHCT says no other church in Ipswich had bells before 1500, and the next oldest ring of five are believed to be at St Bartholomew the Great in Smithfield, London, which date from 1500. Dr John Blatchly, chairman of IHCT, described reaching the fundraising target as "very good news indeed". He said: "This is the most exciting project I've worked on in Suffolk." The public appeal was launched after the Heritage Lottery Fund turned down an application for funding earlier this year. The £62,000 was raised through donations from the public and grants from a range of organisations, including Ipswich Borough Council and the Suffolk Guild of Ringers. The money will be used to build a new belfry, eight metres below the existing one in a sturdier section of the tower. The work is expected to begin within weeks and the bells could be ready for use early next year. St Lawrence Church, in Dial Lane, was reopened earlier this year after being converted into a community centre.